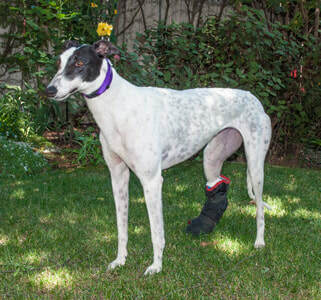 Your donation to our Benefactor's Fund will go directly to the medical needs of the more severely injured or sick retired greyhounds. Every GreySave Benefactor will receive two Benefactor decals and thank you tickets or a gift of nominal costs based on the amount contributed. Please note - there is the opportunity for you to opt out of any gifts if you like. Donations to GreySave above the cost of any not-nominal gifts are 100% deductible since GreySave is a Federally recognized 501(C)(3). To find out more about GreySave's benefactor drive, what it pays for, the number and percentage of hounds we have historically brought in injured or ill and see pictures of some of those 2017 hounds keep reading. To skip to the quick donation links just scroll to the bottom of the page. All donations to the Benefactor Funds will go directly to the needs of the more severely injured or sick retired greyhounds. This fund is set up to cover the costs of the above normal medical costs that some greyhounds come to us with. Every GreySave Benefactor will receive two Benefactor decals, thank you gift(s) based on the amount contributed and a thank you acknowledgement for your tax-deductible contribution. Donations to GreySave are 100% deductible since we are a Federally recognized 501(C)(3). GreySave takes in all greyhounds that come our way, whether they are sick or healthy, old or young! We do not look for a specific gender or color or the healthiest or the cutest. We just take the dogs that are waiting for us at the track on Homecoming Day. Every greyhound comes to us as a medical mystery - they come to us “as is". We don't get medical information or, in most cases, even vaccination records. Homecoming day is always a busy one as we try to assess the new kids and determine if they need special medical care. Thankfully, most don't need extra medical/vet help for breaks and illness, so they can start their new life in a greyt foster home. This fund is for the others, the less fortunate who need more! What we do know is that in recent years approximately 20 to 24% of our greyhounds come in with medical issues, mostly broken legs. Medical issues other than broken legs may be broken toes, eye problems, torn muscles, autoimmune diseases, congenital blindness and an occasional early age cancer - just about anything else that may have made them not perform well at the track. So far, in 2017, we have taken in 17 dogs with broken legs, plus numerous others with costly medical issues. Our adoption fee of $300 does not even begin cover all of the basic costs associated with getting a healthy greyhound ready for adoption, so we need to raise money from generous people willing to help us and who share in our goal of getting all greyhounds off the Caliente track and into loving homes. ​Note: Much of the change in costs tends to be variables beyond our control, such as: escalating veterinary, lab and medicine costs; increasing numbers of special needs dogs; more severely broken leg dogs; increasing numbers of otherwise healthy dogs with less serious but chronic medical issues like old fractures, eye issues, broken toes and skin conditions. We know that with help from you, our dedicated Benefactors, GreySave will be able to continue to take in any track-weary greyhound whether young or old, healthy or sick. See the table below for suggested levels of donations and pictures of some of the special medical needs hounds our Benefactors Fund has helped so far this year. Benefactor Donations at all levels include a personal acknowledgement letter for your tax-deductible contribution plus additional thank you gifts are offered for donations at the levels levels listed below. Another option is that you can request we send no gifts other than the Benefactor stickers, raffle and events tickets. You can donate using either a credit or debit card or if you prefer PayPal (see options below) or you can save all the banking fees and send a note and a check to GreySave, PO Box 632, La Canada CA 91012-632.